JAMES L. POWELL of Fort McKavett, was appointed to The University of Texas System Board of Regents by Governor Dolph Briscoe in January, 1979, to serve a six-year term. He served as chairman of the U.T. 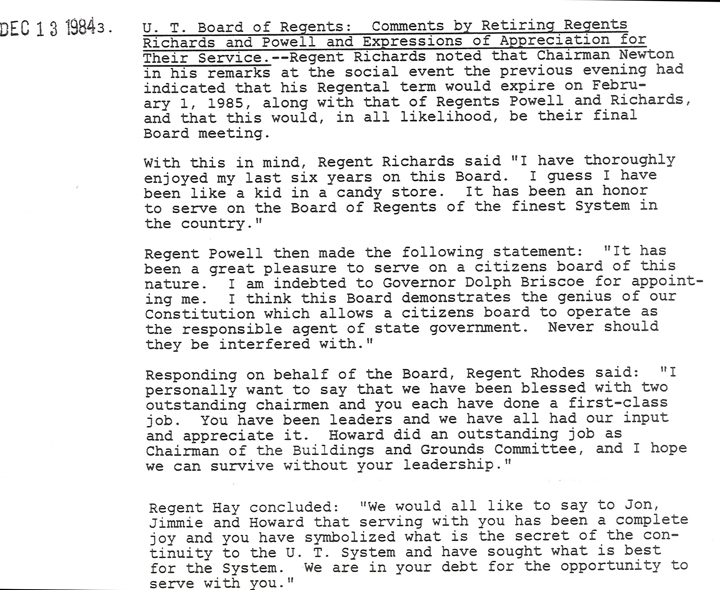 Board of Regents from January 24, 1981 to April 15, 1983. Mr. Powell is a rancher and banker and has had extensive experience in higher education. He was appointed to the Texas State University System Board of Regents in 1971 by Governor Preston Smith and was reappointed by Governor Briscoe in 1977. He ultimately served as chairman of that board, which supervises Angelo State University, Sul Ross University, Southwest Texas State University, and Sam Houston State University, from 1976 to 1978. He resigned from that board to accept the U.T. System regency. He received his B.A. from Rice University in 1951, and did graduate work in economics and finance at The University of Texas at Austin. His Powell Ranch, near Fort McKavett, has been the site for extensive agricultural experiments involving foraging quality. His work in range and livestock management has received nationwide acclaim, and he was named "Man of the Year in Agriculture" by the Texas County Agricultural Agents Association in July, 1978. Mr. Powell, born in 1930, is President of First National Bank, Mertzon, Texas, and is on the Board of Directors of First National Bank of Eldorado, San Angelo National Bank, Texas Commerce Bancshares, Inc. of Houston, and West Texas Wool & Mohair Company, Mertzon. He is a member of the Executive Board, Concho Valley Council, Boy Scouts of America, and has held many positions of leadership in livestock and ranching associations and councils. In 1961, he was president of Texas Sheep and Goat Raisers Association, and has also served as president of the National Wool Growers Association. He is past director of the Mohair Council of America and the Texas and Southwestern Cattle Raisers Association. He is a current member of National Cattleman's Association and served on the Secretary of Agriculture's Technical Advisory Committee for Multilateral Trade Negotiations in 1975. Mr. Powell is a veteran of the U.S. Navy, and is married to the former Nancy Hunt of Sonora. The Powells have two daughters, Lorrie and Victoria, and are members of the Presbyterian Church.